Private family lounge equipped with television, telephone, comfortable seating arrangements, and kitchen. Memory support activity room featuring a sound system and assorted tactile stimuli. A large, enclose (fenced in) courtyard allowing residents to enjoy the outside atmosphere while maintaining their safety. Receives specialized training in all aspects of the resident's needs, including medical, emotional, spiritual, physical and psychological, as well as behavioral management and communication techniques. Family member's input is very important when the staff assesses the resident and develops a plan of care. Family members are encouraged to participate in all Unit activities. Provide emotional and physical support to residents and their families. 2 Certified Nursing Assistants, 1 Licensed Practical Nurse, and 1 Registered Nurse are usually available on each unit. Respite Care is designed to maintain the level of care provided in the home, on a temporary basis, in our health care center. Jefferson Manor Health Center believes that every older adult has the right to maintain their Independence within their home environment for as long as possible. Jefferson Manor supports the efforts of the caregivers in our community by offering the Respite Care program. Respite Care provides the opportunity for a caregiver to enjoy a weekend getaway, take a short vacation, or even receive the healthcare they need in order to best care for their loved one. 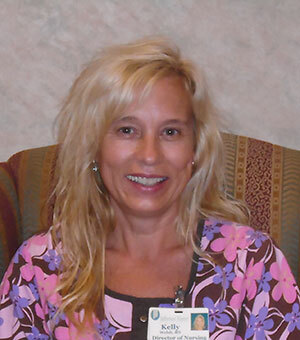 Jefferson Manor Health Center is pleased to announce that Kelly Welsh, RN is now Wound Care Certified (WCC) and Ostomy Management Specialist Certified (OMS) through the National Alliance of Wound and Ostomy Care (NAWC). The NAWC is the largest growing group of certified wound care professionals in the United States and is the most diverse and inclusive wound care certification organization today. The WCC provides direct patient wound and skin care in acute, long-term care, and/or home settings. Skin and Wound Management is a specialized service with a focus on overall skin care and promotion of an optimal wound environment, including prevention, therapeutic interventions, and rehabilitative interventions. Jefferson Manor Health Center is proud to have this service available in our facility to provide our residents direct care, education and resources for the ideal outcome in wound and skin management. Skin and wound management includes the identification, assessment, management, prevention and continuing evaluation of patients with alterations in skin/tissue integrity, that includes but is not limited to pressure, vascular, arterial, and diabetic ulcerations, as well as skin conditions resulting from incontinence, surgical procedures and/or trauma. Contact Heather Lasher Admissions Director at 814-849-0616 to request information or to schedule a tour.